A photofacial is a quick 30-minute treatment to brighten and improve skin tone by reducing the appearance of brown spots, redness and broken capillaries. After just one treatment our Denver clients are pleased with results! For maximum effectiveness, we recommend three to six treatments in total. This intense-pulsed light (IPL) eliminates brown spots, sun damage, broken vessels, and rosacea for a more overall even skin tone. Stay out of the sun for 14 days. You can have your typical sun exposure you would on a normal day but no laying out in the sun or beach time 14 days before your treatment! Plan accordingly! Don’t schedule any big special events for 3 to 4 weeks after the treatment to ensure you are fully healed. Plan to arrive at the Denver Laser Solutions office 45 minutes before appointment where we will apply a numbing crème to the treatment area. This numbing crème will help you stay comfortable during your Photofacial. During the 15 to 20-minute treatment, we start at the forehead with a wand about the size of a fingertip which can feel a little cold to the touch. We work in rows, moving down from the forehead towards the eyes, cheeks, and chin depending on the selected area. As we work down the face, the Photofacial technology produces flashes of light and a sensation which feels like a little rubber band snap. Goggles are worn during the treatment to protect eyes from the light. 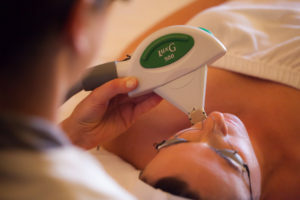 Immediately after treatment, our Denver Photofacial clients report feeling a warmth in the treated area, similar to the sensation when of being in the sun or wind for long periods of time. To help cool the skin, we use a water based gel and a rolling pin ice pack. For the next three to four weeks after your Photofacial, sun damage to your skin will be pulled out. It will appear like coffee grounds or black pepper when it reaches the surface of the skin. Many of our Photofacial clients wear makeup to cover up this temporary discoloration. Following the treatment, Photofacial clients should continue their skincare regime as usual. No special procedures or products are necessary. This combination produces less downtime and faster results! We recommend pairing a MicroPeel two weeks after Photofacials to clients who want to speed up the exfoliation process. Photofacials and Micropeels work great together because while the Photofacial clears up the skin tone, the MicroPeel brightens the skin and vacuums up what is coming to surface. Mix, match and save - Combine a Photofacial treatment with a micropeel to help with skin tone and texture! Combine 3 photofacial treatments with 3 Micropeel treatments for a great jumpstart into good skin health, AND receive a 20% discount, taken on packages of 6 treatments. Photofacial is a quick, 30-minute cosmetic treatment using intense pulsed light (IPL) – also referred to as optimized pulsed light – to improve the skin tone by lightening brown spots and diffusing redness or broken capillaries. A broad spectrum of light is scanned over the full face, targeting red and brown pigment. These targets absorb the light which is then converted to heat. The heat essentially lifts brown spots to the surface causing them to crust and flake off revealing a more even complexion. Blood vessels coagulate and are reabsorbed by the body, causing them to fade from view. Some of our Denver patients liken the sensation to a rubber band snap. At Denver Laser Solutions, we recommend coming in a little early before your appointment. Then we can apply prescription-strength numbing cream to make the treatment more comfortable. Even though protective goggles are worn during the procedure, some clients can still see a bright flash of light. Usually they are more surprised by the flash than the actual sensation itself. What is recovery time for a photofacial? You may experience a feeling of redness, akin to a mild sunburn, which may last for a few hours. If we are treating many blood vessels, you may also experience minor swelling. Particularly in the cheeks and under the eyes. Over time, the pigmented sun spots will darken and start to crust over like cracked pepper or coffee grounds. These will eventually flake off in seven to ten days. Blood vessels may seem more visible immediately after treatment but they too will begin to fade from view. One treatment is effective at removing years of sun accumulation but a series of three to six treatments will be needed to see maximum results. Photofacials can bring about dramatic results to the skin. But having a good skin care regimen and wearing sunscreen every day will ensure you get the most out of your investment. Your aesthetician will go over the proper use of skin care products during your visit. Any side effects to photofacials? With darker skin tones, if done incorrectly, it can cause hyperpigmentation. It clears and balances skin tone, helps correct broken capillaries and heals rosacea. Any downtime from a photofacial? If you have a special occasion, we recommend getting a photofacial approximately three to four weeks ahead of time.